From Monday morning, 15 April 2019, 96 lanterns with lit candles will also be displayed on the steps of the Hall, and members of the public are invited to pay their respects and can leave tributes if they wish. 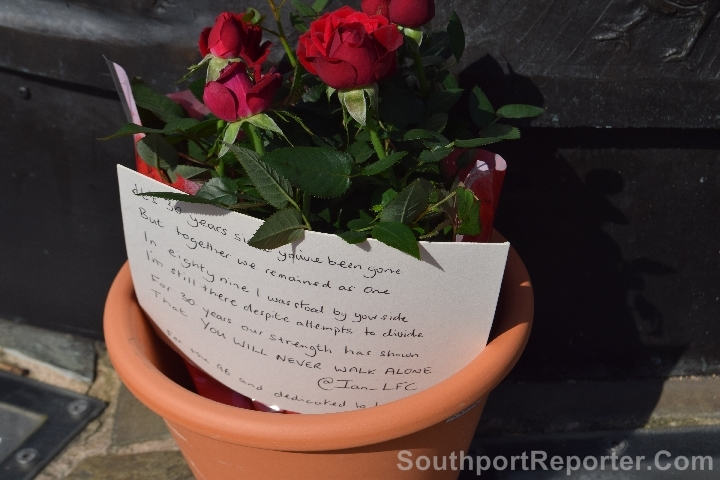 Mayor of Liverpool Joe Anderson will join Liverpool's Lord Mayor, Councillor Christine Banks, at 10.30am, on the day of the Anniversary, to lay a wreath on behalf of the people of the City. Also on Monday, Liverpool will mark the Anniversary by falling silent for a minute at 3.06pm; the exact time the fateful match was stopped. 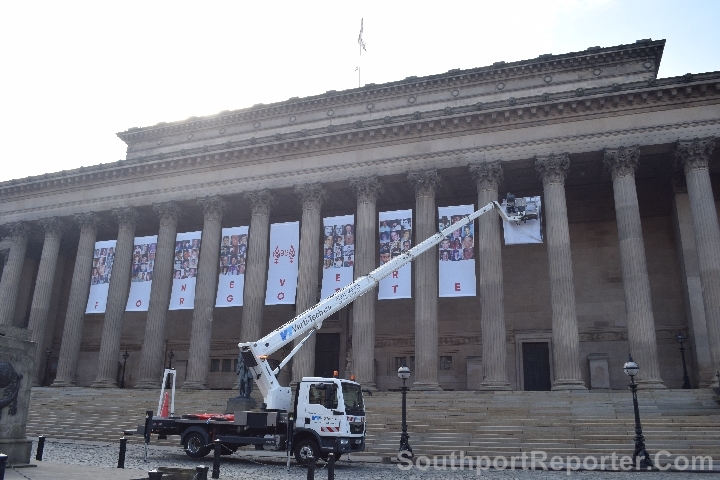 Flags on civic buildings (Cunard Building, Town Hall, St George's Hall and Central Library) will be flown at ½ mast and bells at the Town Hall will toll 96 times. 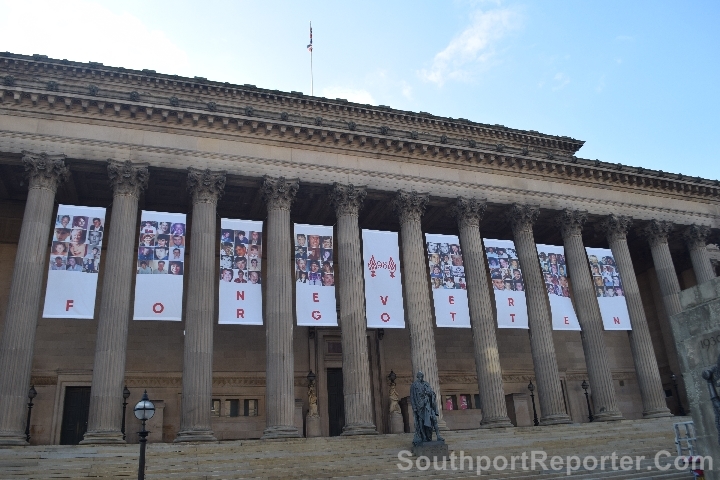 The Lime Street media wall, opposite Lime Street Station, and the M62 digital screens will display the words 'Never Forgotten' in another visual tribute to the 96. The Mersey Ferries will also mark the Anniversary by sounding their horns, and traffic will be stopped for 1 minute, at both tunnels at 3.06pm. Offices and shops across the Liverpool City Region are also being asked keep the 1 minute silence. Other organisations taking part in the silence include:- National Museums Liverpool, Tate Liverpool and Liverpool 1 and Liverpool Bid Company will ask shoppers to observe the silence. The lanterns will be on display until the morning of Tuesday, 16 April 2019, and the banners will be in place until Thursday, 18 April 2019. The Hall will also be lit up red each evening during the week. 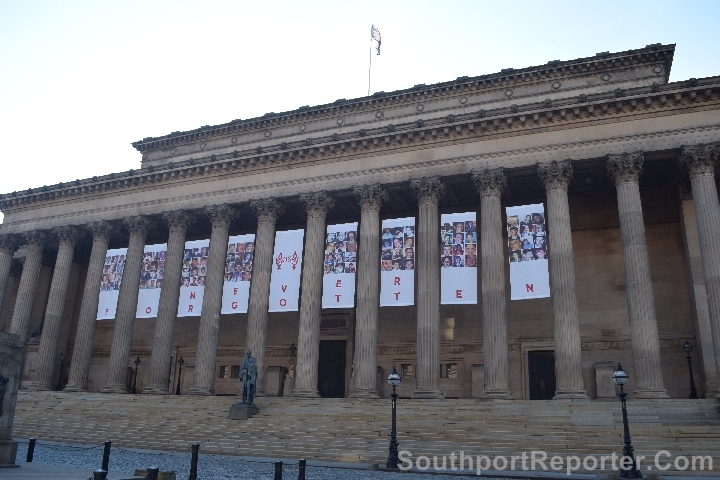 Mayor of Liverpool, Joe Anderson said:- "The 96 have never been forgotten and even though this City is divided by our footballing allegiances, we have been united in supporting the families and Hillsborough survivors for the past 30 years, and will continue to do so. 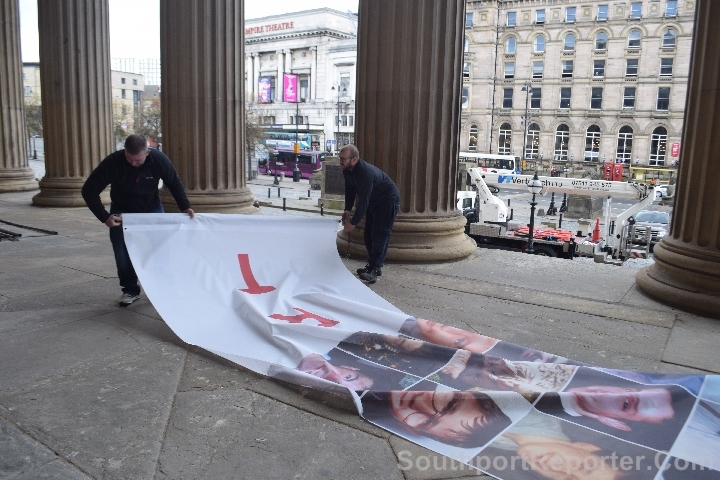 St George's Hall is our City's gathering place; whether to celebrate or commemorate; and I can think of no better venue to host a temporary memorial. 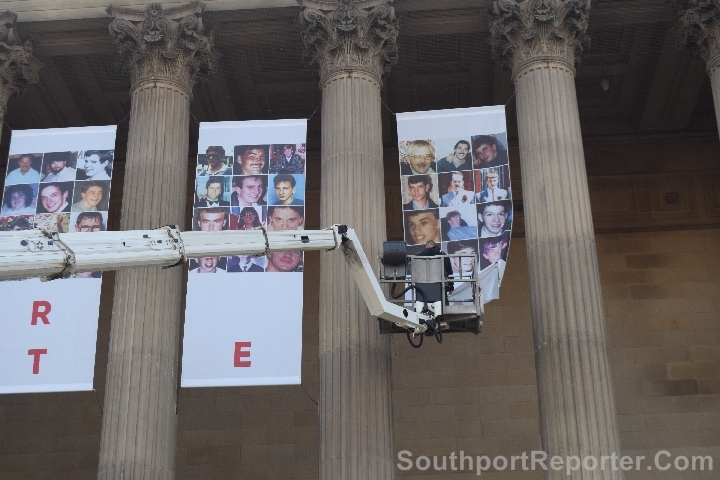 The banners adorned with the images of the 96 will be especially powerful, and the lanterns will serve as a reminder that this City will never forget them. I'm sure many people will take the opportunity to head to the plateau to pay their respects or leave a tribute and we can once again show how as a City we stand together in solidarity." 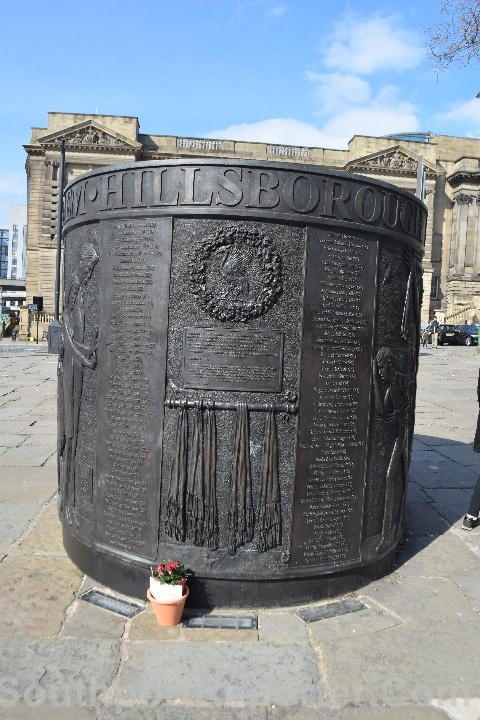 Lord Mayor, Councillor Christine Banks, said:- "We will never forget those who lost their lives at Hillsborough, and I urge everyone in Liverpool to observe the silence as a mark of respect to those who died and the family and friends they left behind. It is always an emotional day, and it will be incredibly poignant as the streets fall silent and the bells toll 96 times. 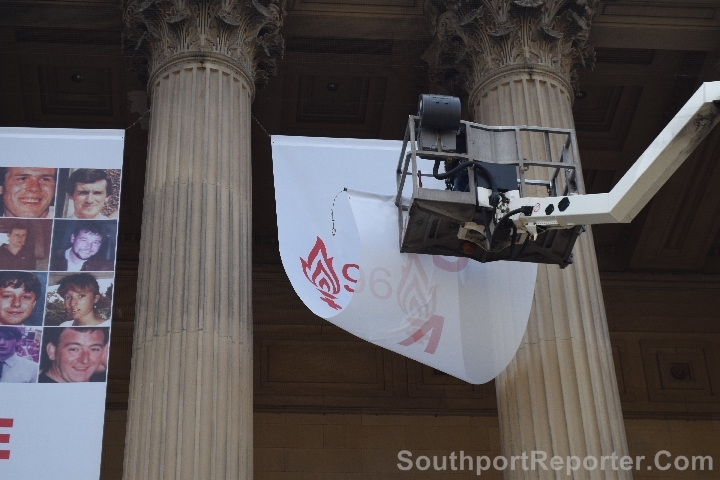 As Lord Mayor of Liverpool I'm proud of this City and how it comes together to mark this sad occasion." Photos by Paul Francis Cooper. 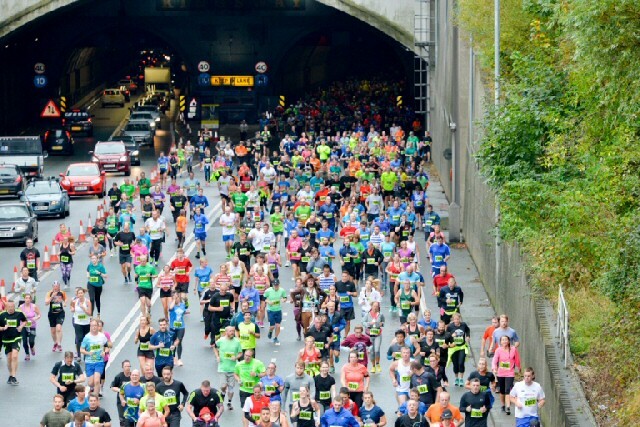 THE 14th Annual BTR Mersey Tunnel 10K takes place on Sunday, 14 April 2019, when 2,600 runners pull on their trainers to take part. The race is sold out. The race starts in Liverpool City Centre at 9.30am, finishing at Marine Point in New Brighton. 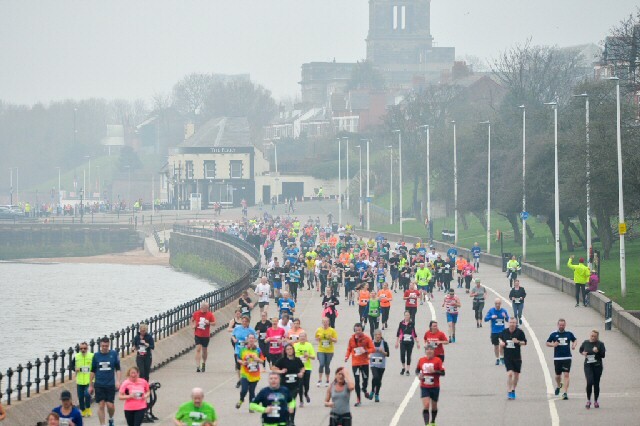 The route takes runners from the start line in Blackstock Street, through the Kingsway Tunnel, along Seacombe Promenade, past Fort Perch Rock and the Marine Lake, to the finish line which is located on Ian Fraser Walk at New Brighton. The Mersey Tunnel 10K returned to the North West race calendar in 2006 at the request of the Mersey Tunnels with BTR Liverpool taking on the mantle. This year, the point to point race will include runners from the:- Isle of Man, Ireland, Germany, and the United States of America. The day's most senior runners include participants ranging in age from 72 years old and 91 years old. Participants also include a team of 8, from 107 Field Squadron Royal Engineers, from Birkenhead, who will be taking part in full military kit. American brothers 69 year old Steve Hailer who lives in Ohio, and Phil, aged 71, from Massachusetts, are visiting Liverpool especially to take part in the BTR Mersey Tunnel 10K. 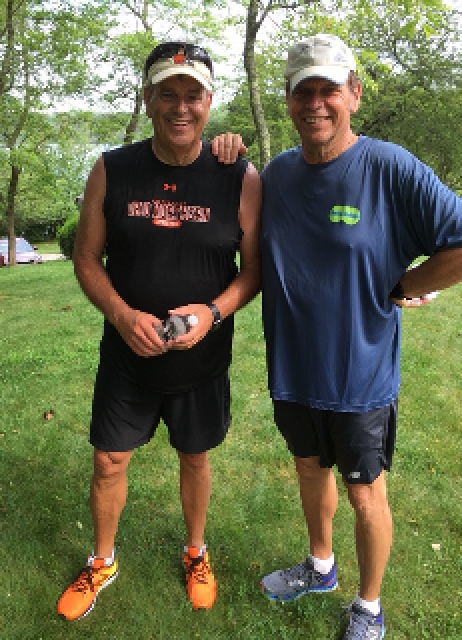 Steve Hailer explained:- "We are really excited to run the race. 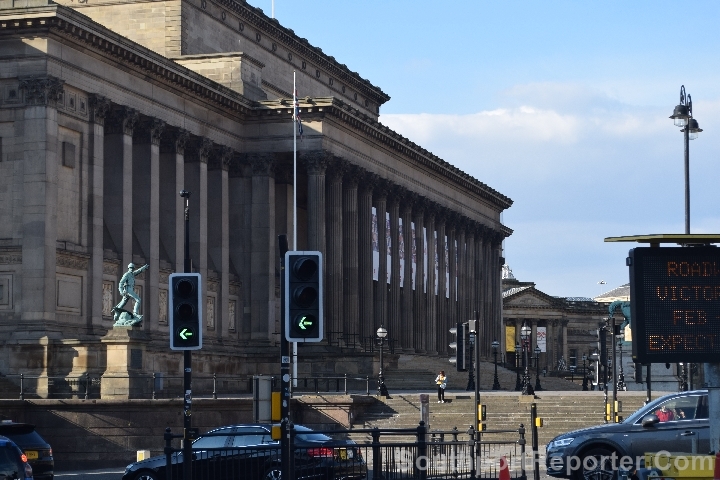 We grew up heavily influenced by The Beatles; so visiting Liverpool is very special to us. I visited 2 years ago with family and just loved the City, so it's wonderful to come back to run a race with my brother Phil on his 1st visit to Liverpool. We're keen runners and Phil has ran 35 Boston Marathons. Thank you to everyone who will be supporting the race, we won't be fast, but we will be having lots of fun; yeah, yeah, yeah! We cannot wait to run Liverpool." The BTR event portfolio also includes the 52 mile BTR Tour Of Merseyside, BTR Liverpool Santa Dash, BTR Wirral ½ Marathon and 10K; and BTR Port Sunlight 10K and 5K. BTR Race Director Alan Rothwell commented:- "The BTR Mersey Tunnel 10K offers runners the rare experience to run through the Kingsway Tunnel and under the River Mersey; now that's a really unique selling point. Our runners tell us it's definitely 1 of the highlights in the North West race calendar. I'd encourage spectators to come along on the day and cheer on our runners along the Wirral promenades; they will be putting their all into having a great race and your encouragement will go a long way. New Brighton is a fantastic destination to stay and enjoy the day." The BTR race portfolio also includes the BTR Liverpool ½ Marathon, which has been shortlisted in the Small Event of the Year category in the Liverpool City Region Tourism Awards 2019. The race, which celebrated its 26th consecutive year in March, is the only sporting event represented across all 17 categories. The winners will be announced on 16 May at a black tie awards ceremony at Liverpool Cathedral.